As Jesus gathered with his disciples for a Last Supper before he was crucified, so we gather around the Lord’s Table on this holy night. One of the most moving and eloquent worship hours of the whole year. We hear the seven “Words from the Cross” that Jesus spoke, and remember soberly the suffering and torments of Calvary. 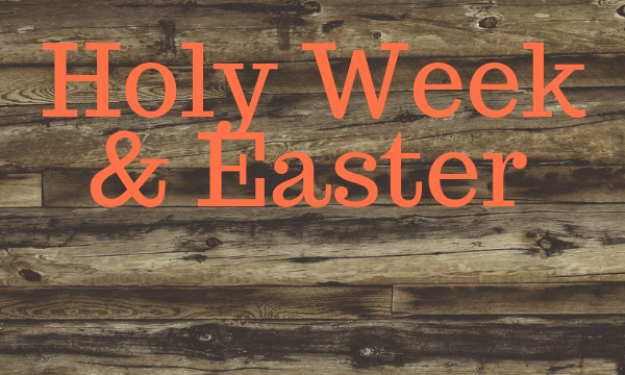 This ancient, traditional worship service provides a dramatic “bridge” between the pervasive gloom of Good Friday and the explosive joy of Easter Sunday. A brief service of Baptismal renewal precedes a joyful, no-holds-barred celebration of Easter victory. Hope’s celebration of the Lord Jesus Christ’s resurrection from the dead will remind us all of the meaning and power of Easter for our everyday living as God’s people. This glorious day begins with an outdoor Sunrise Service of Holy Communion, with special music led by the Praise Team. Three festival services will follow, in the worship Sanctuary, with special music led by the Handbell Choir, Senior Choir, and Brass Ensemble. The Sacrament of Holy Communion will be celebrated at three Easter Sunday services (6:30, 8:00 & 11:00AM in the Sanctuary), and also at the Easter Vigil Service (Saturday, 7:30PM). At the 9:30AM Easter Sunday Service, we’ll focus especially on the new life given to Christians in the Sacrament of Baptism, as we remember and renew our Baptismal vows. At the new Easter Children’s Service (11:00AM in the Children’s Center), there will be songs, skits, laughs, and most importantly the good news of Jesus’ resurrection told in a way that everyone can experience. Easter Lilies will adorn the chancel on Easter Sunday. You may sign up to purchase a lily in honor of or in memory of a loved one. The sign up sheet will be at the Welcome Center and the cost of lilies is $11 each. After the 8:00 & 9:30AM services, everyone is invited to the Adult Education floor for an Easter Morning Reception. Please consider bringing plated and ready-to-eat brunch goodies – baked goods, pastries, bagels, fruit, muffins and come join the fun! The Easter Cross of Flowers will be placed on the church lawn for Easter Sunday. All worshippers are invited to bring one flower (any color, any style) and place it through the wire mesh on the cross before entering the service. It's a great spot for Easter Sunday family photos, a tradition for many families.